Making pizza by oneself is not difficult, but it always takes a little more time than I want it to. Don’t let that dissuade you, though, because pizza makes the best lunch at the office ever, and you’ll have enough for the whole week. Most of the time-sink comes from prepping all the ingredients before you start, and the crust. 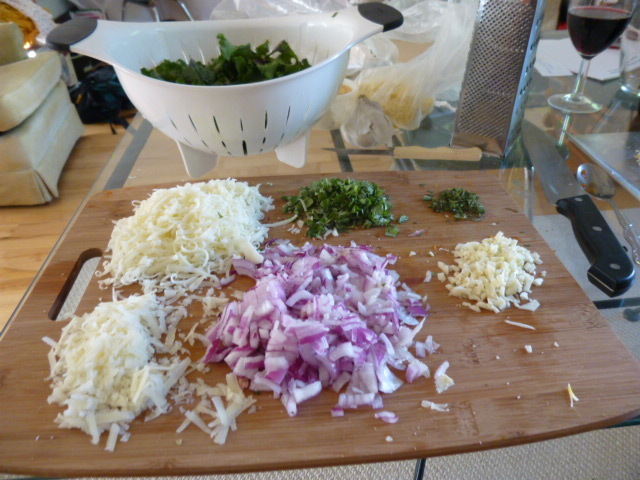 Once you have everything mise en place (put in place), the fun of putting it together begins. 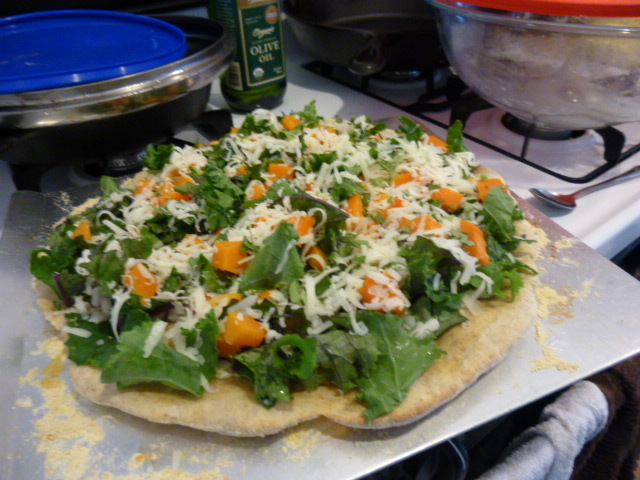 This pizza (which is inspired by an asiago-squash-kale pizza served in my college dining hall) is great because you can pretty much make it from local ingredients most of the year. Kale is very hardy and can grow in unheated greenhouses through late fall and in spring in Maine (probably one of the reasons for the Eat More Kale trend). And winter squash keeps for a long time in cold storage, so although it is a fall crop, you might still have some through early spring. The red onion I bought at the grocery store, but onions also keep well for a long time. The crust requires the most planning, meaning that you can’t just decide an hour before dinner to make pizza. I have a sourdough starter I’ve been using (more on this in a future post on bread), so I made a sourdough pizza dough from King Arthur Flour’s website, but they also have a regular crust recipe. I like King Arthur Flour a lot – it’s a good product, they have nice recipes, and the company is also a Benefit or B-Corporation, which means that they accept social and environmental responsibility even as a for-profit corporation (other B-Corps include Ben & Jerry’s, Method soap, and Cabot cheese). Although I’ve also been trying to include Maine flour, which comes to the store through the Crown O’ Maine cooperative, who are trying to better distribute Maine products around the region. You can also often buy pizza crust at the grocery store, which is good if you are short on time. Since there are good recipes linked here, I won’t restate them, and if I work on my own pizza crust recipe, I’ll put that in a future post (my Italian uncle says use bread flour and a cold rise overnight). The hard part about pizza crusts is rolling them out properly. I’ve had fairly good luck just rolling them out with a rolling pin (or an empty, washed wine bottle if you don’t have a rolling pin), but if you roll it too much it can get tough. So, my recommended method thus far in my pizza-making experience is based off of King Arthur’s: to make is as flat as possible with your hands in the air first, then put it on a cornmeal-dusted sheet and push out to the sides. Take a break halfway through and then continue, it will be stretchier. This takes a fair bit of time but it gets the crust nice and thin, which is what I like (I’ve tried waving it around in the air like a Fancy Pizza Man but I inevitably end up with a bunch of holes in the dough and a very uneven height. Oh well, keep practicing). King Arthur recommends pre-baking the crust a bit, and I did do that for this pizza mostly because I don’t have a pizza stone to make the bottom of the crust all crispy. Something else to add to the Kitchen Wishlist. The squash will take the longest, but can be made ahead and kept in the refrigerator for a few days if you want to prepare it early. Or maybe you have extra squash from something else and you need something to do with it. Anyway, cut it in half, scoop out the guts and seeds (which can be washed and roasted like pumpkin seeds if you like) and then into wide slices (maybe 8 pieces per half). This will require a sharp knife and some elbow grease. Roast in the oven at 400ºF for at least 30 minutes, probably longer, until soft (so you can poke it with a knife), but not squishy. Remove, let cool, and then peel the skin off. Cut into about 1/2 inch chunks. You will have extra, so just put it in a container in your fridge to eat by itself or add to something like kale pesto (coming soon). Once the crust is rolled out (don’t forget the cornmeal so it doesn’t stick) and pre-baked if you like (see above), you are ready! I made two medium pizzas from the dough. Drizzle olive oil on the crust and spread the garlic on top (this is a very light sauce. If you want more, you could make a béchamel sauce by melting butter, mixing in flour, adding a little milk and cooking it down before spreading it on the crust). 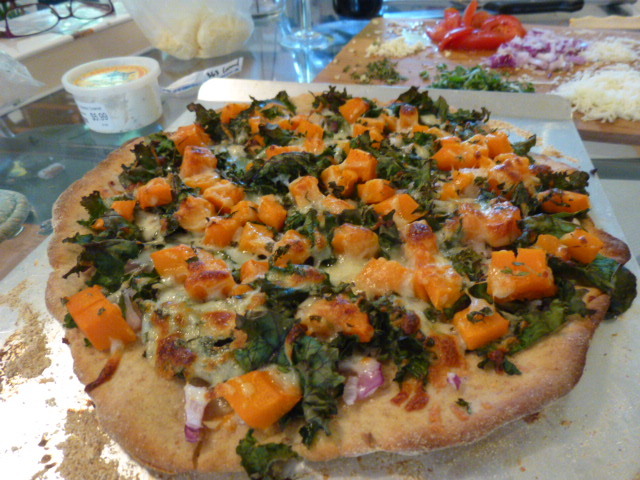 Top with red onion, kale, squash, mozzarella, then the tomme/asiago and some salt and pepper (I left this out of the first one and it makes a big difference). I also threw on some fresh oregano from my fridge. I like that order because the kale can cook a little more under the other toppings and the cheese gets all crispy on top, but if you prefer crispy kale and softer cheese, reverse it. Bake in an oven that is as hot as you can make it (real pizza ovens get up to 800ºF or higher but mine only gets to 500ºF) for about 10 minutes, until the cheese is melted and crispy and the crust is nice and brown, even on the bottom. Slice and enjoy! Best hot. Slice up the leftovers (it is rather easier to cut when cold) and wrap them up to take to work or put in your fridge for another dinner (I recommend a toaster oven for warm-up rather than a microwave, to keep it crispy). Careful when taking them out because the toppings might slide off the crust.